Fabulous studio with beautiful ocean views located in an oceanfront luxury Hilton resort community with 3 beautiful ocean front pools. This Royale Palms studio features 9 ft ceilings, and granite countertops in the kitchen area and bathrooms. The resort has a sand bottom pool with cabanas and a huge ocean front tiki bar with live bands during the summer. The resort is part of Kingston Plantation, which is a private 145 acre beautifully landscaped resort complete with walking paths and lakes. It features 14 pools, a half a mile of secluded beach & several restaurants and bars along with a 24 hour security entrance gate. The Royale Palms area is minutes from all the action and hundreds of golf courses but it's tree lined streets and acres of freshwater natural lakes make it the best of both worlds. There is a 50,000 sq ft health and sports club complex complete with tennis courts and a huge workout facility with all modern equipment available for a fee. Beach/Pool cabanas also available for rent(with TVs, internet access, and other treats!) Beautiful beach area with everything you could desire. Kingston Plantation includes an on site full service Hilton Hotel, Embassy Suites Hotel, with restaurants, pool snack bar in season. The plantation is located in the prestigious Arcadian Shores area close to Restaurant Row, Barefoot Landing and Broadway at the Beach. 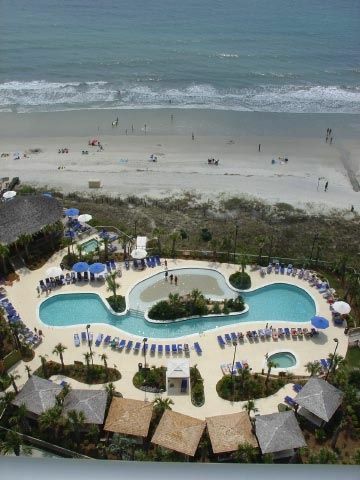 Keywords: Studio with amazing ocean views in fabulous Royale Palms Ocean Front Resort!! My beach place at the Royale Palms is the ideal vacation rental for 2 adults! It is located on a beautiful, wide sandy beach close to a 500 acre ocean front nature preserve! You have all of the amenities of a ocean resort and the feeling of pristine nature just steps away! And in addition, South Carolina's Myrtle Beach is known as the Golf Capital of the World, with over 1980 holes. Sailing, kayaking, fishing, and live beach music fill the days! Concerts at the House of Blues, Market Common, Alabama Theater, Palace Theatre, etc. fill the nights! And fabulous happy hours, art festivals, delicious restaurants, and special events add entertainment and flavor for a perfect vacation! Enjoy! This ocean front location is ideal for a vacation with all of the amenities of a ocean resort and the feeling of pristine nature just steps away! So close to everything you need and want, including Starbucks and the New York Times downstairs, yet feels so far away from the crowds and traffic! You can walk to golf, tennis, yoga on the beach, the ocean, and excellent restaurants ocean front. Or simply play in the 3 ocean front pools and hot tubs, while listening to live music at the ocean front tiki bar and cabanna! Fun! The property includes a full service ocean resort! Amenities include 3 ocean front pools, a golf course, a beautiful ocean front restaurant, Starbucks, a fully stocked gift shop with gourmet beer and wine, ocean front cabanna restaurant and bar, friendly and experienced concierge, business center, meeting space, and much more! Fabulous view of 3 freshwater lakes! new 50,000 square foot Health & Sports Facility with 3 racquet ball courts, sauna and indoor pool available for $10 per person per day Fee. Several very nice full service restaurants on the property, as well as a variety of other options for food, drinks and coffee. Studio Kitchen Area with Microwave, Refrigerator, Sink, Keurig and Regular Cofee Makers, Toasters, Dinnerware and Utensils. new 50,000 square foot Health & Sports Facility with 3 raquet ball courts, sauna and indoor pool available for $10 per person per day Fee. The two of us came to just do nothing this trip. And we were very successful. Just a great place and set up with hotel amenities and steps to the beach. We have been coming to Myrtle Beach for years and will keep coming back. Cindy will give you a warm welcome and make sure everything is just like you would expect it. Thank you! Great meeting you! And I am delighted that you enjoyed your stay! I look forward to seeing you again soon! My girlfriend and I came down late on a Thursday for a long weekend stay. We got a very late jump but Cindy was more than kind enough to accommodate us. The studio was immaculate! It was clean, well cared for and stocked to meet all of our needs, including beach chairs, towels, robes, internet, boogie boards, etc. This place is ready! The private parking deck of the Royale Palms/Hilton Resort was nice and we had no hassle obtaining a free parking pass. The only noise we heard at night was the sound of the ocean and it was as peaceful as one could hope for. The bathroom was huge and clean and the view off the balcony was impressive. Cindy was super nice, offering us suggestions in the event we needed somewhere to grab a snack while on the beach to letting us have a later checkout so as to not be rushed. Could not have been more perfect! The only thing I can say that wasn't perfect might have been the mattress but coming from a memory foam to a firm mattress, that was to be expected. It didn't hinder our sleep or rest in any way. I can not recommend this place or Cindy enough. We will definitely be back. Thank you Brian! I enjoyed meeting you and look forward to seeing you again soon! We met Cindy when we first checked in, and she is so sweet! Her condo is so cozy, and we loved the resort! Everyone who works at the resort is so friendly. We had such a great time, and we can't wait to come back at the end of summer. My wife and I wanted to have an early Summer Getaway to North Myrtle Beach. We were looking for something nice and affordable...usually those two are difficult to find together. Cindy's condo was so much more than we expected. The location (right on the beach and way up high with an exceptional view), is perfect for early morning coffee or late night chilling while listening to the crashing waves. The condo was immaculate and the most ideal size for a romantic weekend. The condo also had EVERYTHING we could possibly need for a day at the beach (beach chairs, boogie boards, towels, etc.) The actual resort was very high class and desirable. My wife and I could certainly see ourselves living there. The adjoining hotel had a great restaurant where we enjoyed dinner when we didn't feel like leaving the resort. Between the restaurant and the Starbucks, we didn't have to leave the resort if we wanted a nice quiet day in. Finally, one of the best memories from the weekend was meeting Cindy. She was so charming and personable and a real joy. She was always available to us if we needed anything, We will definitely check Cindy's condo first when we return to Myrtle. Thanks Cindy!! Thank you Alex! I enjoyed meeting you and your wife and am delighted that you enjoyed your stay! I hope to see you again soon! Zip-lining in the Tree Tops; Culinary Events; Wine Tasting; Dancing; Concerts; Water-color Painting Instruction. Please call 614783 1671 to discuss. Payment terms and rates are subject to change until confirmed.